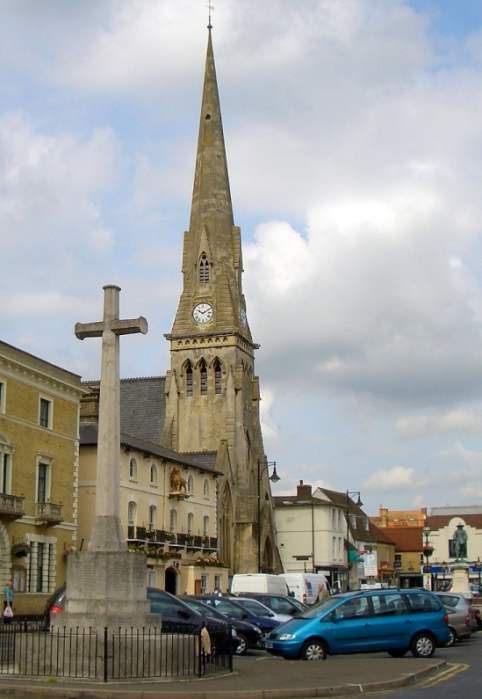 This Gothic-style church occupies a prominent position on Market Hill, and was given a tall spire to rival that of the nearby parish church. Much of the money for constructing it was donated by a wealthy local miller and nonconformist, Potto Brown, whose name is still well remembered in the area; the architect was a relative of his by marriage. Pomeroy's statue to Cromwell stands in the middle of the road outside the church. "The Free Church: A Brief History." Available at the church. Thanks also to Gill Innes of the Free Church, and to the Norris Museum, St Ives, for finding out about the architect.